Okay so here is the skinny on this cute little dragon. The design is called Futurecast (a.k.a. Herald) from one of my favorite designers Teresa Wentzler. If you like castles, fairies, mid evil stuff, then she is hands down the one to go to. Now, the bad news. Her patterns are hard to find, believe me, I started collecting her ten years ago and eBay became the place to shop. I may or may not have have paid $50.00 for one of her patterns at one time or another. Now, the good news. Wentzler is taking another look at her designs and converting them from hand drawn to computerized. She is also releasing some of the designs through Patterns Online. It’s a long process but according to her blog she is enjoying it. However, Futurecast is a freebie that can be found on her website. You all know I buy most of my supplies through Embroidery Central. What you don’t know is they have a sense of humor and like to create some fun and challenging projects for their stitch group. They decide to do an April Fool’s challenge with thread based on your birthday. There was three threads picked from DMC, metallic, and hand dyed. Further, the project had to be a certain size. My mother bought my colors for me which were Ecru from DMC, PB34 from Rainbow Gallery, and Father’s Day from Weeks Dye Works. I thought what in the world was I going to with these then settled on this particular pattern. Of course, I changed the rest of the colors as well. Unfortunately, I started stitching him before the start date of the April Fool’s challenge so I kinda disqualified myself from the challenge with this pattern. I am still allowed in the challenge with a different pattern but I also need to get some stitching done for the silent auction at the Idaho Elks Summer Convention in Moscow, Idaho. I guess I will see what happens. If you have any questions or concerns about stitching this little cutie, just send me a comment either here or you can find me on Facebook. Happy stitching! I have two free days to do some stitching. I’m thinking about working on my Heaven and Earth which has been sadly neglected for a few months. Maybe, we will see what happens. By the way, I did add some other social media stuff that you could all follow. This way we can stay connected and inspire each other. I have an you add me, I’ll add you policy; unless, you start spamming me then I’ll block you. Anyway, as soon as I get some stitching done, I’l show off my progress. Happy stitching! The fabric room at Embroidery Central. 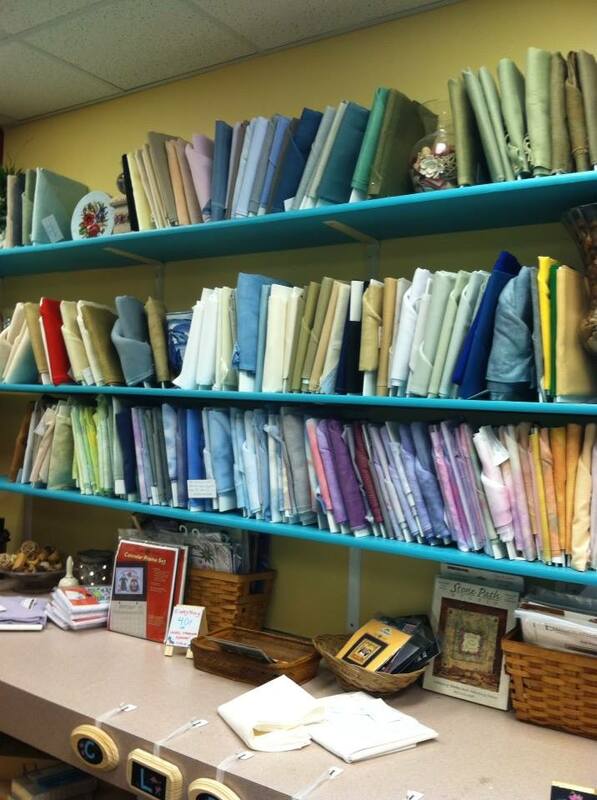 No, you have not gone to heaven but it may seem like it when you enter the fabric room at Embroidery Central. Yes, the fabric is out in the open for you to look at. I believe the top row and some of the second row is aida. The rest is all different shades, colors, and counts of linen; including opalescent. 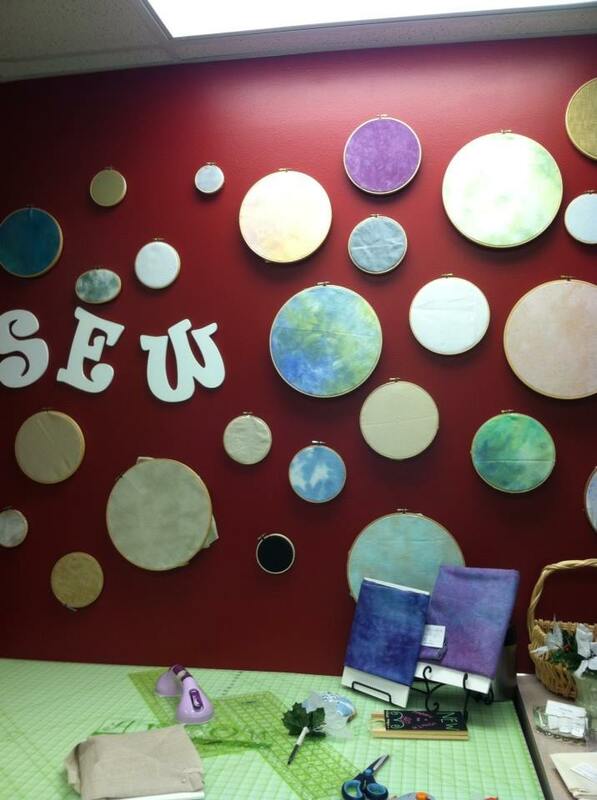 The wall above the cutting table at Embroidery Central. Now, you can look at the fabric and pull some off the shelf. However, you do have to ask the employees to unwrap and cut the piece you want. In fact, they are more than willing to help you find the perfect piece of fabric for your project. Sometimes they will even pull fabric off the shelf just to give you more choices which is perfect if you just can’t decide. 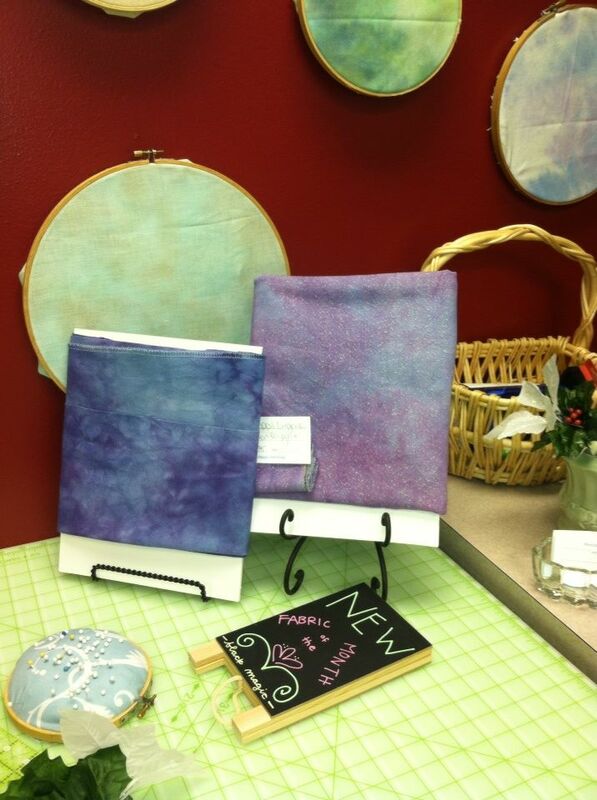 The fabric of the month at Embroidery Central. They also have a fabric of the month that is guaranteed to catch your eye and make you ask yourself, “What can I put on that?! ?” They also have jars with various scrap pieces for smaller projects that start at a $1 then go up. The fabric room at Embroidery Central is my favorite room and tends to get me in trouble financially. Happy Stitching!